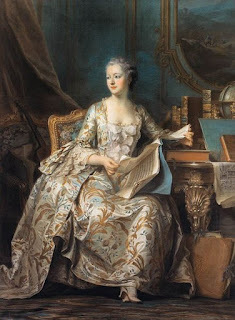 La Tour told me that, whilst he was painting Madame de Pompadour, the King entered the room in a state of dejection after the defeat at Rossbach. She told him that he must not be depressed, that he would make himself ill, and that, in any case, it would be after them that the Deluge came. La Tour remembered this remark; when the King had left he said to the lady that her dictum had pained him; it would be better for the King to be ill, than to have his heart hardened. [Il [la Tour] m'a raconté que peignant Mme de Pompadour, le roi, après l'affaire de Rossbach, arriva fort triste ; elle lui dit : qu'il ne fallait point qu'il s'affligeât, qu'il tomberait malade, qu'au reste après eux le déluge. La Tour retint le mot; quand le roi fut parti, it dit à la dame que ce mot l'avoit affligé, qu'il valoit mieux que le roy fût malade que si son coeur était endurci]. This letter is the only secure contemporary reference to the infamous remark ascribed to Madame de Pompadour, après nous, le déluge. The actress Marie Fel, was the long-standing mistress of Maurice Quentin de La Tour. Writing to La Tour's brother, she recalls a series of anecdotes previously related to the author and connoisseur Antoine-Nicolas Dezallier d’Argenville, who was perhaps planning a biography of the artist. There is no reason to doubt Mlle Fel's testimony. 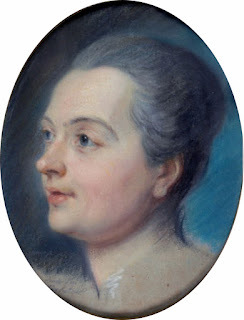 (La Tour might have slightly remembered the context, since his famous portrait of Madame de Pompadour, which required many preparatory sittings, dates from 1755 whilst the Battle of Rossbach did not take place until November 1757). However, it is harder to know exactly what Madame de Pompadour might have understood by the phrase. Was she really cynically prescient about the cataclysm to come, or was "après moi, le déluge" just a popular saying? The phrase is not a common one, but it does occur in several late 18th-century sources. There are various possible classical precedents. A Greek verse attributed to Euripides, translates as "after my death the world will be consumed by fire". (Cicero, De finibus.x.vi. )A work of 1779, identified après moi le déluge as the French equivalent, "a horrible maxim which has become almost a proverb". Guillaume Dubois de Rochefort, Histoire critique des opinions des Anciens...sur le bonheur (1779) p.239-40. Frederick the Great wrote to d'Alembert in a letter of 26th April 1782 that he was glad to have been born in the time of Louis XIV and observes that "as a consolation in the face of the future, one should say après moi, le déluge". To Frederick, however, the maxim did not imply culpable insouciance, but merely acceptance that the world to come was outside the individual's control, "a perpetual theatre of vicissitudes, a moving scene where everything changes." Dr Michael Sonenscher has shown that in the pre-Revolutionary period the phrase increasingly came to be used to condemn government financial policy. It was applied particularly to life annuities, a means of funding public debt which was seen as mortgaging future financial and economic viability. The elder Mirabeau, in a work published in serial form as early as 1769, calls the annuities the quintessence of that "dangerous sentiment après moi, le déluge" Similarly, Mercier in his Tableau de Paris summarises the selfish shortsightedness of the rentiers: "Neuf, dix pour cent; et après moi le déluge". 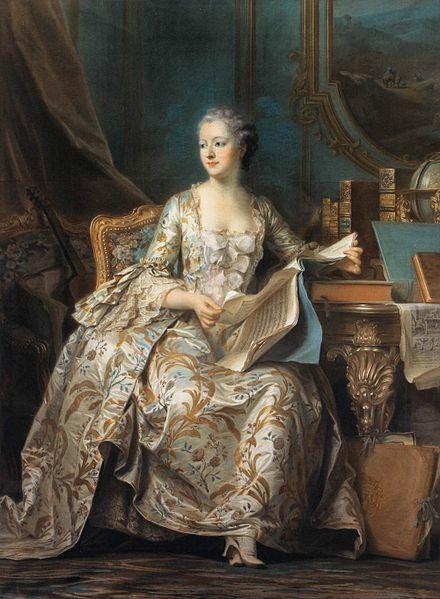 All of this does not quite explain how the dictum came to be regarded as the defining attitude of the ancien régime, nor why it was so strongly associated with Madame de Pompadour. The earliest reference I can find is in an essay by the English writer Richard Edgeworth in 1812: "'Après nous le déluge' - was one of the favourite maxim of Madame de Pompadour, and of that profligate weak government, which...probably prepared the calamities of France"
Madame de Pompadour, in the intoxication of prosperity, replied to all threats in the future, with three words which she repeated often: Après nous, le déluge. Thus did she see a revolution approaching and announce it. The benefit of hindsight is a marvellous thing!